Wash and hull strawberries, then slice. To make the dressing: Whisk the lime juice, parsley and the olive oil together. Season with salt and pepper. Pour over the salad, gently toss and serve. 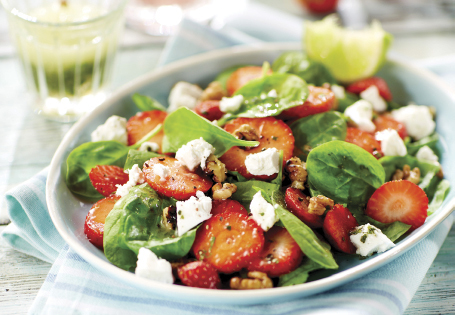 Tip 1: You can sauté the walnuts in a warm pan before adding to the salad for a different flavour. Tip 2: This salad is large enough to share. If only making for a lunch box, half recipe ingredients.